Shorelines on ESI maps are color-coded by sensitivity to oil. Symbols mark localized areas for biological and human-use resources. Environmental Sensitivity Index (ESI) maps provide a concise summary of coastal resources that are at risk if an oil spill occurs nearby. Examples of at-risk resources include biological resources (such as birds and shellfish beds), sensitive shorelines (such as marshes and tidal flats), and human-use resources (such as public beaches and parks). When an oil spill occurs, ESI maps can help responders meet one of the main response objectives: reducing the environmental consequences of the spill and the cleanup efforts. Additionally, ESI maps can be used by planners—before a spill happens—to identify vulnerable locations, establish protection priorities, and identify cleanup strategies. Download ESIs: Download from this page ESI maps and data in a number of formats. Order ESIs: Learn how to order ESI maps and data from OR&R. 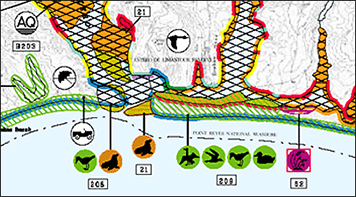 Uses GIS techniques to integrate maps of a region with geographically-referenced biological resources, human-use resources, and ESI-classified shorelines that are ranked based on their sensitivity to oiling. Contains a summary view of ESI data on the back of the paper map, and GIS versions of the ESI data that can be used for more complex queries. Serves as a quick reference for oil spill responders and coastal zone managers. Available as a single map, or a regional collection of maps called an ESI atlas. Available in electronic formats (including several GIS formats) for most coastal regions of the U.S., as well as a few international locations. ESI maps are created by NOAA OR&R researchers, working with colleagues in state government agencies, federal government agencies, and industry. Basics: Learn about the basic elements of ESI maps, including the types of information that are mapped. Toolkit: Browse a collection of resources for ESI users. Availability: See the regions that have been mapped and available formats. Formats: Review the types of formats that are available for ESI maps and data. Sample ESI Atlas [PDF, 2.2 MB]: Review this sample ESI atlas, which includes an ESI map with seasonality data; background information about shoreline habitat ranking and sensitive biological and human-use resources; a list of species included in the atlas; a description of shoreline habitat types; a map legend; and guidelines for interpreting ESI maps. Questions: Contact us with questions, comments, or suggestions about ESI maps.